The Damnwells, possibly the hardest-working band you’ve never heard of, have decided to give it all away, here. They play Live at The Mercury Lounge, April 4th. 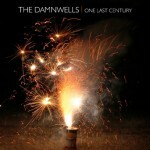 Be the first to comment on "The Damnwells Let ‘Er Rip"